Literary award season is in full swing. We’ve had the Leftys, the Agathas, the Edgars, the Ippys. The Anthonys, the Barrys, and many others will be awarded between now and September to honor excellence in crime writing. But is excellence in crime writing the only thing that’s prize-worthy? This week’s question for my fellow Missdemeanors is, if you could invent your own literary, or any other, award, what would it be and to whom would you award it? 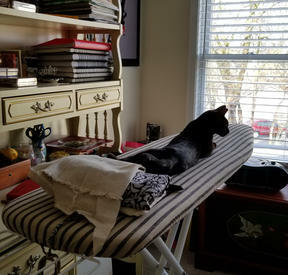 I’m awarding Agatha “Best Adaptive Use of an Ironing Board” RobinSome mornings lately I feel like there should be a Meerkat Award for successfully coming out of my hidey hole and standing on two feet without collapsing and tumbling over my pack mates. MeCan I nominate myself for the Meerkat Award? TraceeI want to win the Meerkat Award and my focus on qualifying has made it difficult to come up with another suggestion. However…. Wouldn’t it be fun to have awards for best jacket copy? Or author photo (I would definitely keep a young version of myself for decades…..)? Or most deceptive jacket copy? I’m sure there are a few people out there who would like to see an award for book that was panned by reviewers but made multiple best seller lists! Not that these aren’t serious things, but at the same time a bit of potential levity during the presentation ceremonies. 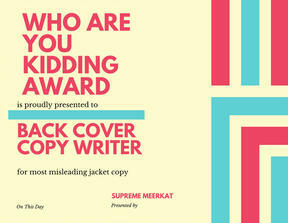 MeI like the best jacket copy and most deceptive jacket copy awards. How about an award for most outdated cover photo or photo that looks the least like the author? SusanI love stories about writers who have overcome all sorts of obstacles and rejections and then achieve success. Maybe an award for the most dogged, single-minded, persistent, relentless, determined writer out there. 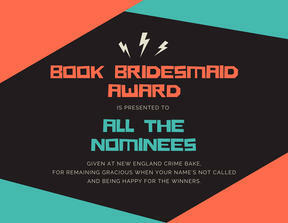 MicheleAt the New England Crime Bake banquet, we now invite anyone attending who has been nominated for, awarded, or received an honor of any nature to join us in a circle of celebration. This is a difficult business and we need to recognize and support one another whenever and wherever we can. I was a finalist in the Malice Domestic first novel contest three times! I kept remembering one of my grandmother’s sayings. “Always a bridesmaid, never a bride.” TraceeI think that’s a lovely idea! RobinI agree with Tracy, Susan, that’s a great idea. And I like that celebration at the Crime Bake. 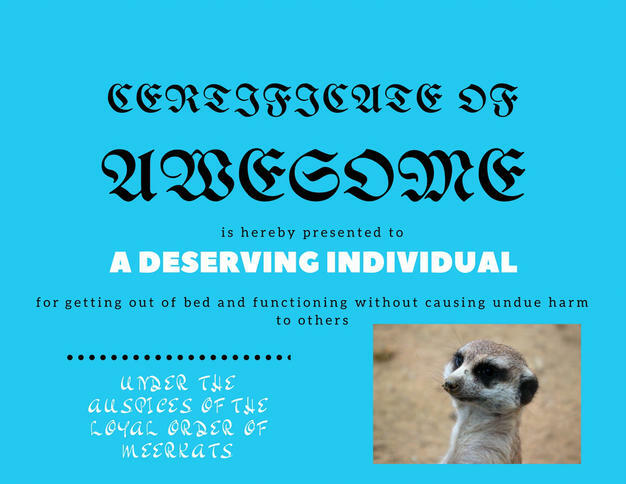 I also think every one of us – and most people but especially writers & artists – should pass around the Meerkat Award. Wrote some words that weren’t on the page before you got there? You win. Smiled and said “hello” to a stranger? You win. Made yourself a cup of coffee without spilling? You win. Thanked someone else for handing you a cup of coffee? You win. AlisonRobin set the bar too high for me with her Meerkat Award. Best. Award. Idea. Ever. I’m awarding it to myself today because I made coffee *and* didn’t spill (plus no pack mates were harmed in the process)! TraceeI totally agree with the Meerkat Award. For me it was all over after that. 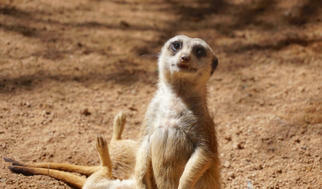 I may try to find that meerkat show on TV…. we all probably need a little more meerkat in our lives! MeHow about made it until noon before ticking anybody off? Does that win a Meerkat? RobinThat totally wins. Great job! [clumping sounds of meerkat paws applauding] “Clumping” = combination of clapping and thumpingI think meerkats have become my new spirit animal. PaulaI am in the middle of moving us and my parents into a new big old house (1760) and I think there should be an award for all of us for not killing each other yet. TraceePaula, There’s still time 🙂 But with a house that old there is surely a ghost…. blame it on him/her. 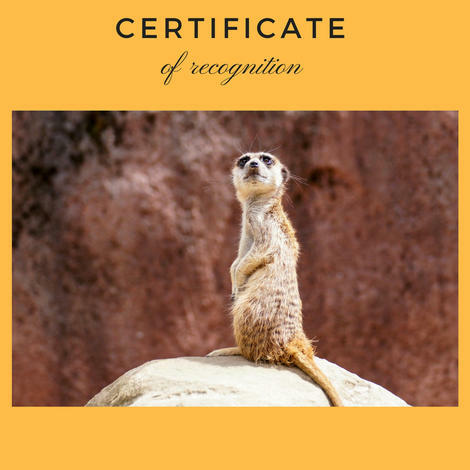 MePaula– Gold Meerkat What award would you give? Who deserves it? Comment here or post your prize idea on our Facebook page. And May the Fourth be with you.